​Diagnosis:​ The red fox has an elongated body with relatively short limbs. It's skeleton is much like a similarly sized dog but the skeleton will weigh close to 30% less than a domesticated dog.There are three different color morphs for this species: red, silver/black, and a cross. The red color morph has bright reddish/rusty hair with a stripe down the spine. Sometimes a lactating vixen will have a dark brick red belly. The tail is longer than 1/2 the body length and is usually pale gray along the underside with a white tip. This species is also fairly sexually dimorphic with females weighing 15-20% less than males. 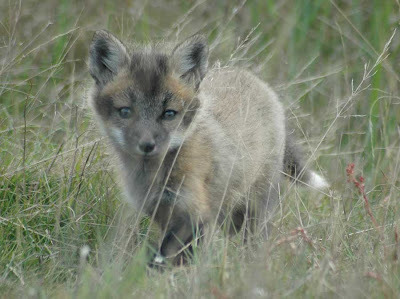 Kits (juveniles) are born with grayish-brown fluffy fur. ​Natural History: ​This species usually lives in a family group or pack made up of an alpha male and/or female with rogue foxes (lone or abandoned foxes adopted by the group) and other family members. The average litter for this species is 4 - 6 kits with larger litters noted where fox populations are low. Kits are born deaf, blind, and without teeth but these will develop and the coat will begin to change around 3 weeks of age. The kits leave their dens when they reach about 4 weeks old and are weaned from their mother around 6-7 weeks. Foxes are considered sexually mature at 9-10 months. The average life span for this species is only around 1.5 years. Distribution: Vulpes vulpes is very widely distributed and it's 24 subspecies range across most of the northern hemisphere. Changes in their coat and other physical features usually relate to their geographic location. Diet: The Red Fox is an omnivore and has a very wide variety of foods in its diet. In the fall the diet is composed almost entirely of fruits including many different kinds of berries. They prefer small mouse-like rodents for protein such as; squirrels, voles, mice, reptiles, and insects. They also supplement their diet with various tubers, sedges and grasses. They prefer to hunt in the early morning and late evening hours and have a unique way of pouncing on their prey.